Anthony Cardenales was a stickup artist in the Bronx before spending seventeen years in prison. Today he is a senior manager at a recycling plant in Westchester, New York. He attributes his ability to turn his life around to the college degree he earned in prison. Many college-in-prison graduates achieve similar success and the positive ripple effects for their families and communities, and for the country as a whole, are dramatic. College-in-prison programs greatly reduce recidivism, leading to potential savings in the staggering cost of prisons. They increase post-prison employment, allowing the formerly incarcerated to better support their families and to reintegrate successfully into their communities, providing positive role models. College programs also decrease violence within prisons, improving conditions for both correction officers and the incarcerated. Liberating Minds eloquently makes the case for these multiple benefits and also tells the stories of many formerly incarcerated college students and the remarkable transformations in their lives. Both access to college for all Americans and criminal justice reform are high on today’s national policy agenda. 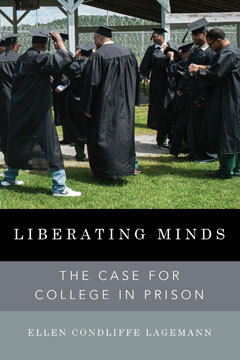 Liberating Minds argues that it is imperative, both for prisoners themselves and for society, that access to higher education be extended to include the incarcerated. As the country faces a legacy of decades of over- incarceration, offering college behind bars provides a corrective on the path back to a more democratic and humane society.